40 by 30 in. 101.6 by 76.2 cm. 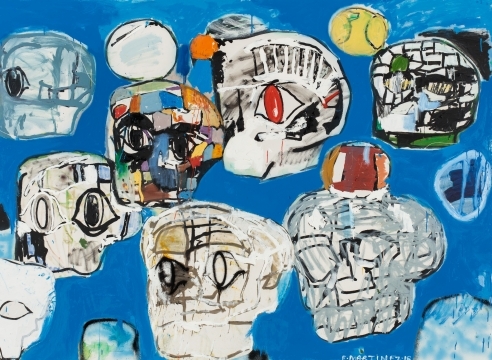 Widely recognized for his large scale paintings that incorporate silkscreens of blown up drawings, Eddie Martinez has built a consistent body of work over the last decade successfully merging the tradition of American abstract painting with the energy of the street. In this new body of work, created especially for this exhibition, Martinez introduces yet a new element to his process in the guise of whiting out parts of the composition, a move that represents a significant point in his career. Erasure has been an important practice since the origins of art, and x-rays of paintings by old masters often reveal ghostly images underneath. 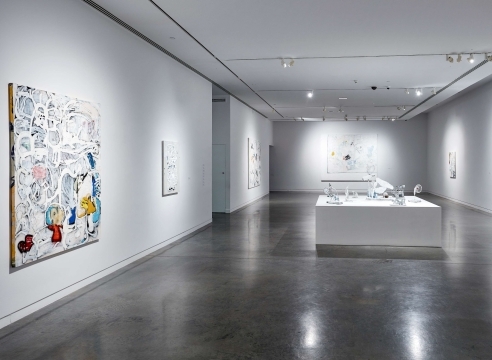 What might have started out of necessity, however, eventually became an effect often referred to as pentimento, and in 1953 it became a celebrated trope when Robert Rauschenberg transformed a drawing by Willem de Kooning by blurring its lines. For many artists, the very idea of whiting out or erasing presents a daunting challenge as it comes enmeshed in connotations of destruction. That is not the case for Martinez, who regards the act of removing or obliterating painted elements not as an end in itself, but as an integral part of the process of constructing a painting. He is aware of how reductive the process of building an image can be—whether abstractly in our brain, or physically in the studio. Martinez is inspired by the shapes and compositions formed on walls that have been painted over with mismatched hues that seem to take on a life and form of their own. The process in his studio follows a similar process, as he is continuously looking for those points of resistance in the work to inform them and guide them forward. Eddie Martinez was born in 1977 in Groton, Connecticut and currently lives and works in Brooklyn, New York. Eddie Martinez: White Outs has been organized by Antonio Sergio Bessa in collaboration with Eddie Martinez. Eddie Martinez: White Outs is made possible by Mitchell-Innes & Nash, Timothy Taylor, Mr. Joseph Chen (PCPcollection), Christopher L. and Elizabeth Apgar, Liz and Jonathan Goldman, and Carole Server and Oliver Frankel. Additional support is provided by SRI Fine Art Services. 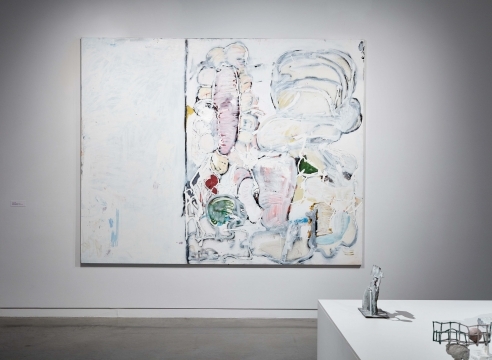 Painting might be summed up as a process of accretion: You start with a blank canvas and end with a covered one — unless you are Eddie Martinez, for whom the act of adding and subtracting remains in play throughout the making. 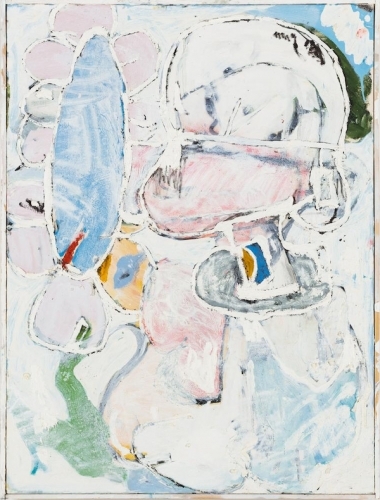 Mr. Martinez’s assertive-but-sly approach is on view in “White Outs” at the Bronx Museum, a selection of recent, ostensibly white paintings. Equally inspired by the New York School and street culture, Eddie Martinez has added a new element to his large-scale paintings by intentionally erasing parts of his compositions. This “white out” technique is informed by art history, as X-ray analysis of the work of the Old Masters often shows erased images hidden beneath the surface of the painting.